Jennifer Cluff: Why is my flute always flat? Why is my flute always flat? A flute student who is trying to figure out why their flute is consistently flat. even though the headjoint is pushed all the way in, wrote to me on my "comments" this week, and so I thought I'd just add a checklist here for those who find their flutes seem consistently flat. What could be the cause of a flat flute? 1. Headjoint cork is out of position. 2. Your lower lip is over-covering the blow hole. For playing in the low register, be sure that your lower lip is not over-covering the blow-hole. For low and middle register the lower lip should only cover 1/4 to 1/3rd of the blow hole of the flute. 3. You are trying to check your tuning with a cold flute in a cold room. It takes a few moments for a flute to come up to pitch if it is cold. If you are trying to tune a cold flute, it will always sound flat. So, before tuning, close all the keys and breathe slowly through the closed tube to warm it up. Do this prior to beginning to tune, and in rehearsals, do this after several bars rest, so that the flute is warm when you re-enter the piece of music. 4. You are blowing too softly, too slowly, or too timidly. This is very very common. To learn to play a flute with a large, resonant, round sound is one of the first things you'll learn in private flute lessons at the intermediate level. Almost all beginners tend toward playing too quietly, and wasting their air (too large a lip-aperture, or unknowingly allowing air to escape through their nose as they blow). To correct this, see this article on how to learn to play forte with a full sound. Why would novice flute band students play consistently flat? How do I tune in a cold room or rehearsal hall? How can I fix a flat low register? Dozens more general Flute Tuning articles for beginners, intermediates and advanced players are here. In general I think that it is possible (but very very rare) that the student who originally wrote to me about playing flat in pitch is playing a flute that cannot be made to play in tune at A-440. Some antique flutes still exist that are pitched at A-435 to A-439, and there are miscellaneous old band flutes (more than 40 years old) of unknown origin that may have a slighly larger diameter, or oversized flute length or headjoint length. However almost every modern flute I've ever seen that played "flat" had either the headjoint cork in the wrong place (too far out) or the student was playing with slow air and a small sound and often too rolled in on the chin as well. In general, to bring a flute up to pitch, if flat, the student needs to practice on a daily basis on increasing the amount of air speed that they blow the flute with. They need to increase the FORTE end of their dynamic range, and work on a smaller and more precise aperture in their lips to create a more vibrant and full, colourful sound. This takes time, and is best done with the help of a private teacher. Once you've learned to play with a full rich and resonant sound, you may find that you indeed are pulling the headjoint out because the flute is now too sharp. You may also find that you need to raise or lower the flute's pressure on the chin so that the "air-reed" is lengthened. 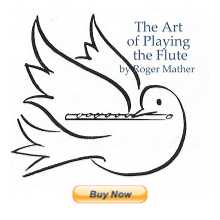 This is all part of the learning curve for novice and intermediate flutists. Once a flute's headjoint draw position allows the flutist to be consistently in tune (when warmed up) over all three octaves, and their skills are starting to develop for playing in tune using dynamics, it's a good idea to mark the best headjoint draw with a shiny-surfaces permanent marking pen, to allow quick assembly each and every time you put the flute together. Having a single placement of the headjoint develops consistency that is necessary to further discoveries about tone quality, air-speed and tuning. You can always remove the mark and re-mark using such a marking pen (remove with alcohol)if your embouchure and style of playing changes over the course of your own tone development. However I find that once located, the marking method is a boon for daily consistency. Student flutists can pre-set to their normal marking and then just heat the flute gently in order to play in tune with any ensemble. For the novice flutist who's still working on all the variables (air speed, blowing angle, tone quality, pitch, etc.) marking the headjoint's draw is still an excellent method to guage what changes are being made over time. b) playing with too slow an air-speed. c) rolling the headjoint inward, or over-covering with your lower lip. d) aiming the air downward too far in angle. At least you aren't moving the cork around anymore, without realizing it, because you know now to leave the crown alone. hahahahaha. Remember to check your cleaning rod's cork placement mark for accuracy. I have the same problem, usually because my flute is freezing. My flute teacher suggested another way of sharpening the pitch, by changing the embouchure. By bringing your lips forward away from your teeth, ie creating more of a tunnel in your mouth, the pitch sharpens. Thanks for a fantastic blog - keep posting and pleas keep us updated re your book! Yes, letting the lips come forward off your teeth gives you a longer tunnel to blow through, and this tunnel can be aimed upward in angle. However if the tunnel was aimed downward in angle, the lower lip might cover even more blow-hole and thus the pitch would flatten. So yes, it works, but only when you aim the tunnel upward in angle comparably. I have been playing flute for over 20 years and my flutes are always a little flat, and yes after warming it up they will come into tune but I need to just pick it up and play the flute solo from cold. Any other instrument I play can be tuned to the band but the flutes have this design problem. So thank you for your blog now I know what I have to do, cut 5mm off the head! It might make a nice silver ring. There are other solutions that might be better in the long run. Cutting off the headjoint so you can insert it farther into the tenon is exactly what happened when the flute scale was skewed by American flute makers when copying the French design from the early 20th century. The result of shortening the headjoint is an uneven scale; where the right hand notes become flatter and the left hand notes become sharper. This means that the flutist must lip up and down to play the one octave scale in tune, and the three octaves are all affected by a different percentage. b) or, pre-warm your flute two to three bars before you have to play when the room is cool. Before you cut your headjoint, send an email to Trevor Wye and ask his advice. He knows all about the mechanical re-tuning of flutes. the article and your comments have made me stay giving my flute the snip. But I think that as I can just slide the head out the 5mm Im thinking of cutting off I can restore the tone hole to key holes lengths after surgery. I'll ask Trevor Wye and get back to you. all very interesting and true however I would like to point out if you own a 440 pitch flute in England you will not be in tune in a 442 environment .yes you might be able to tune up on the note A but the scale will never be true and Intune you cannot play a scale continually by altering the tuning also and very important the holes and spacing on a 440 flute body are in different positions to that of a 442 flute. Thanks Ken. Of course I should have mentioned that: "Are you playing an A-440 flute and expecting to blow it up to A-442 because you're in Europe, but your flute was made in North America?" Hi Jen - I've been working with an amateur flutist for six months and his flute continuously rolls in, especially for the high notes, covering too much of the hole. He ends up to be a quarter step flat. I try to get him to support, blow faster air, keep the flute rolled out, all with minimal results. Do you have any other ideas? Have you tried re-aligning the headjoint so that it's not center-to-center, but far-edge of blow hole lined up with center of keys? I'm following up with you regarding my student who is continually rolling in and going flat. I adjusted the headjoint position a few weeks ago and it seems to be working. It's odd though. I actually do the opposite with my own headjoint and other students seem to feel more comfortable with their hands rolled out. If they do, I'll just align the headjoint in. I used to align the headjoint out for students years ago until most (maybe all) just kept rolling in so they didn't have to blow or support. Roll and rolling in until their wrist is cramped all the way back. I just haven't had the success with this positioning, so I haven't been using that technique. So here I am and so far he hasn't been resorting to rolling it in and his pitch is much more stable. Thank you! Hi there, and thanks so much for following up. I'm so glad that that worked. So if the weight of the rods rolling inward is combined with a flattish chin (not very concave) then you have the student you are speaking of. Thanks for thinking about this on my behalf. So many variables. 5. The preferred wrist and hand position of that particular student at that particular point in their development. It's funny how unconscious we all are about the many choices of hand position (and elbows, and shoulders, and head-turn) that we all go through as we develop. Thanks for the lesson, but there is one problem. My flute is still half a note flat and my flute is tuned to the max. Please help me solve this problem. Have you taken the flute to a flute teacher? They can likely figure this out for you. Also: The phrase "tuned to the max" doesn't make sense to me. Can you re-phrase that please? Does that mean that the headjoint is all the way in? Did you check that the cork is in the right place at the other end of the headjoint? Are you sure you're tuning it to a reliable electronic tuner set to A-440? Or are you trying to tune it to a sharp piano; a recording that is A-442 in pitch? A clarinetist who's calling the note names differently than you do? Are you sure you're letting the metal become warm before tuning it? (cold metal equals flat in pitch). Are you blowing forte and mezzo forte? (soft, slow air can make the flute sound flat). Check all these and write back. No, I have not taken it to a flute teacher yet, and the phrase tuned to the maxed means the head joint is all the way in and the tuning cork is in the middle. When my band teacher uses his tuner he plays a random note for me to play. Every time he does this, I'm always flat. I always make sure my flute is warm before tuning. When I tune, I play in all dynamic ranges(piano-forte), and I reposition my lower lip every time I tune in an attempt to make my flute sharper. If the flute teacher also finds that the flute has some kind of flatness problem, then it will turn out that it's the flute, not you. So do that first. Then you'll be prepared for your bandmaster's (slightly bizarre) way of tuning you in class. It's really hard to just suddenly blow and play perfectly in tune with a random note if you're not doing it all the time at home when you practice. Also, if you take lessons you will develop a really reliable way of consistently playing in tune over three years or so. Also, if you've only been playing a few months, what you're going through is pretty normal. You'll get it. I'd like to add to this thread that sometimes it really IS the flute. I've been struggling with the tuning on my flute for the past few months - I've really had to battle against it, even moving the headcork down. It was driving me bananas and was starting to have a sinking feeling that somehow my embouchure was deteriorating (been playing for 23 years). Anyway, I recently took my flute to a local service man - turns out there was a very slight leak around one of the trill keys. I've not seen this mentioned anywhere as a potential culprit for tuning issues - but if you think where the pads are for these keys, it's easy to see how a slight leak would completely alter the tuning. So might be something to try if you're struggling yourself - check the pads for the trill keys, and even if they're visible ok, make sure there is a perfect seal (get a friend to hold them down while you try the tuning?) and try tuning.